Malaysia’s trade with the Netherlands reached USD 7.9 BN in 2017. 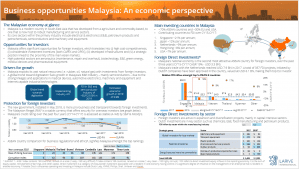 What made Malaysia’s economy the second most attractive ASEAN country for foreign investors? The director of Larive’s local partner from Malaysia will be in the Netherlands between 7-9 November 2018 and together we provide you insight on the business opportunities in the Malaysian market. Malaysia is a modern country in South-East Asia that has developed from a agriculture and commodity-based, to one that is now host to robust manufacturing and service sectors. Its core sectors within the primary industry include electrical & electronics (E&E), petroleum products and petrochemicals, semiconductors and machinery and equipment. Malaysia offers significant opportunities for foreign investors, which translates into (i) high cost-competitiveness, (ii) considerable investment incentives [both CAPEX and OPEX], (iii) developed infrastructures and (iv) a strategic position linked to the proximity of the main Asian markets. High potential sectors are aeronautics (maintenance, repair and overhaul), biotechnology, E&E, green energy, medical devices and pharmaceutical equipment. Malaysia exploits its vast natural resources (i.e. rubber, oil, natural gas) with investments from foreign investors. A global trend toward digitization fuels growth in Malaysia’s E&E industry – mainly semiconductors – due to the strong linkages and applications in medical devices, automotive electronics, machinery and equipment and internet-capable industrial technologies. The new government, installed in May 2018, is more pro-business and transparent towards foreign investments. The Malaysian Ringgit (RM)¹ is a stable currency that offers security for overseas investors (see graph below). Malaysia’s credit rating over the past four years (CY’14-CY’17) is assessed as stable (A-/A3) by S&P & Moody’s. ASEAN country comparison for business regulations² and ethics³, signifies Malaysia amongst the top rankings. ~70% ASEAN countries and ~30% EU and USA. 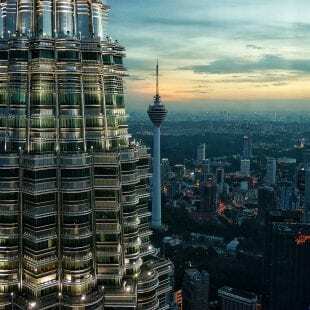 Malaysia’s national economy is the second most attractive ASEAN country for foreign investors, over the past three years (CY’15-CY’17 CAGR 19% – USD 3.3 BN). Malaysia’s trade with the Netherlands reached USD 7.9 BN in 2017. A total of 337 FDI projects, initiated by Dutch⁵ companies have been approved in the country, valued at USD 6.1 BN, making them top EU investor. Foreign investors are active in expansion and diversification projects, mainly in capital intensive sectors. Dutch investment are in key sector such as chemicals, E&E, food manufacturing and petroleum products. Larive is represented by H20 Capital in Malaysia. Our director from Kuala Lumpur, Tham Yit Jin will be in the Netherlands between 7-9 November. If you are interested further exploring and identifying the opportunities for your company in Malaysia, we have the possibility to set-up a personal meeting with Tham Yit Jin at our office in Zeist. Please note that we have limited availability. You can send your request before October 19th to info@larive.com or reach us at +31(0)30 69 33 221. ¹ EUR-RM: 1 – 4.85 ² Index contains 190 countries, ranked on a scale (1 easy –190 very difficult). ³ Index contains 180 countries, ranked on a scale (1 very clean – 100 highly corrupt). ⁴ FDI refers to direct investment equity inflows in the reporting economy. It is the sum of equity capital, reinvestment of earnings, and other capital. Direct investment is a category of cross-border investment associated with a resident in one economy having control or a significant degree of influence on the management of an enterprise that is resident in another economy, ⁵ Notable Dutch companies operating and investing in Malaysia include Dutch Lady, KWME, Phillips, Shell, Unilever and Vopak. What will change under the new Myanmar Companies Law Climate is changing. Food and Agriculture must too.